New worksheet available! Stress LESS. I have been scribbling different versions of this worksheet for some time now, and I finally have a version that I’m excited to share. It is the first in a series of worksheets that I will be making available on the (heyyyyy) WORKSHEETS PAGE! Me, being not stressed about being covered in Jell-o at my son’s 7th birthday party. Yep, he still likes getting messy, I’ve just joined him. This first worksheet is all about identifying your response to stressors. We all need LESS STRESS, and I am 100% sure you can shift your perception of your personal stressors (well, most of them anyway) to have less stress. The basic idea is that you will identify your stressors. After you have identified your stressors, you can then have a real conversation with yourself about whether you choose to have a stress response to that or not. That’s right, you get to choose in more cases than not. The example I always give in my clinic is when my son was about 2-3, he was obsessed with emptying all toothpaste, all dish soap, all shampoo, bubble bath, you name it..into the sink or the bath tub. We would be having a normal day, getting ready to leave the house and I’d realize that I sent him to get socks (or pants or whatever! ), and he didn’t come back straight away. I would know that he was probably getting into something, and I’d feel this mild fury rise in me that he was wasting another tube of toothpaste. Even though the grownups had put it out of reach, my 5 year old probably hadn’t…..lo and behold a sink full of toothpaste AND toilet paper because he actually tried to clean it up. I was right, but I was in no place to acknowledge he was a little kid trying to learn. That moment sucked, and I wanted so much to have had a different response. It was predictable. He did it All. The. Time. He was an insatiable tiny mad scientist. I had to learn to have a new response in that very moment. I had to decide that I would not allow myself to become stressed about wasted toothpaste. I had to decide that as I walked down the hall, rounding the corner to the bathroom, that I would take pause, assess the situation, and do my best to not allow this particular stressor become STRESS IN MY BODY. It was as simple as making a decision to respond differently. I use this example as a jumping off point. Other stressors may require more complex changes, but I’d highly recommend downloading the worksheet, and see just how many perceived stressors you can shift without embodying them anymore! Ahhhhhhh, year SIX of the Wild Woman Trail Marathon and Relay (and 50K). This was an ON year for me. That puts me at 4 good years with this race and 2 not so good years. I shaved 39 minutes off last year's race (an "OFF" year) and 15 minutes off my fastest time for the course so far. Beyond the actual race, I simply love going to the event every year. I get to meet up with runner friends from Idaho, Washington, and Oregon....and every year there are runners from far-flung places that show up. It's a great event. So great that I'm stoked to announce I'll be sponsoring a team of high schoolers to run next year! Pic by Launa Gray: Cooling off in the stream-fed horse troughs at the finish line. Mission Accomplished! Save the date (Wednesday July 25th), tickets for the next talk are LIVE! Check out our new location at Cookshop in SE Portland. You ladies are in for a treat! A portion of each ticket sale will benefit PDX Alliance for Self-Care - PDX ASC. Even in your neighborhood, slow down, find the beauty cultivated within your direct radius. All of these incredible flowers were found on a walk less than a mile from my home. To the beauty creators and cultivators, thank you. It is crucial to reset by looking at nature and appreciating the small things. 1. Miyazaki Y., Park B.J., Lee J. Nature therapy. In: Osaki M., Braimoh A., Nakagami K., editors. Designing Our Future: Local Perspectives on Bioproduction, Ecosystems and Humanity. United Nations University Press; New York, NY, USA: 2011. pp. 407–412. 5. Brod C. Technostress: The Human Cost of the Computer Revolution. Addison Wesley; Boston, MA, USA: 1984. Bear with me, this is a message of hope. Birthdays roll around once a year. How do you feel on your birthday? This poem, by Pablo Neruda is close to the thoughts I have. I have been reading the book "Endure" by Alex Hutchinson over the past few weeks, and today was the day I put into practice what I learned. I challenged myself to hike Dog Mountain before work today, and I knew it would be tight. I'd have to keep moving up the 3000ft elevation gain over 3.8 miles up the side of that mountain. One of the big take home lessons that I gained was "actual" vs "perceived" exertion. This chart really stuck with me. The decision to stop. The decision. To stop. So all morning I practiced deciding to continue and push myself. It felt kind of magical. There were moments of "what the heck? ", but there were more moments of, "Look at me go!" I must've asked myself about 50 times if I was actually needing to slow down or if I was deciding to slow down. One of the final, glorious pushes to the top! 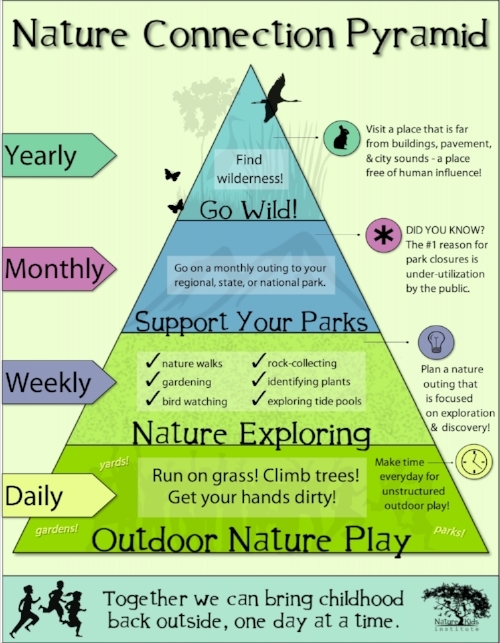 I love love LOVE this pyramid for nature consumption! It comes from the Nature Kids Institute, but I'm using it with my grown-up patients as well. Get outside. EVERY. DAY. My very dear friend, EB Ferdig is a genius when it comes to helping people manage anxiety with yoga. Her next series starts on 5/3, with a discount if you register by the end of today. Series cost is $150 - but only $99, if registered by April 26! Space limited to 10 participants, register today! The five-week series will be taught by E.B. Ferdig, E-RYT50, a yoga therapist who has been helping people with anxiety for over ten years. E.B. is highly compassionate and knows personally what it’s like to live with anxiety. She will guide you, as she has hundreds of others to a place of greater peace, clarity and personal power. Hit this link to sign up and begin feeling relief. There are a growing number of articles that show a clear connection between increased mental wellbeing, stress relief and even immune system activation. when exercise is conducted in forested green spaces. In the UK and Japan, they study this phenomenon extensively, citing active components that are directly responsible for all these positive effects. That fresh pine smell, for example, is actually alpha and beta pinene. These naturally occurring volatile aromas increase Natural Killer cells, which help us battle things like viruses and tumor cells. You don't have to smell the woods, to get the benefit though. In the UK, researchers found that just looking at peaceful, natural scenery while exercise increased several health parameters. So, exercise in nature if you can, but also consider switching from zoning out with a TV show on the treadmill to treating yourself to some seriously beautiful views instead. Li Q1, Kobayashi M, Wakayama Y, Inagaki H, Katsumata M, Hirata Y, Hirata K, Shimizu T, Kawada T, Park BJ, Ohira T, Kagawa T, Miyazaki Y. Effect of phytoncide from trees on human natural killer cell function. Int J Immunopathol Pharmacol. 2009 Oct-Dec;22(4):951-9. Li Q1, Kobayashi M, Inagaki H, Hirata Y, Li YJ, Hirata K, Shimizu T, Suzuki H, Katsumata M, Wakayama Y, Kawada T, Ohira T, Matsui N, Kagawa T. A day trip to a forest park increases human natural killer activity and the expression of anti-cancer proteins in male subjects. J Biol Regul Homeost Agents. 2010 Apr-Jun;24(2):157-65. De Vries S., Verheij R.A., Groenewegen P.P., Spreeuwenberg P. Natural environments—Healthy environments? An exploratory analysis of the relationship between greenspace and health. Environ. Plan A. 2003;35:1717–1731. This is an absolutely fabulous article written by a mama on self-forgiveness and being human. I love it. I think if we keep in mind what it means to be human, to replenish our stores of grace, and to forgive ourselves when we feel we haven't been our best selves or parents....we can have healthier happier dynamics at home and in the world. Give it a read!